It’s not a secret that beautifully hoppy beers can be great partners to food with a bit of heat in them, like a loved-up couple. It’s about balance between hop bitterness in your beer and heat in your dish. So it’s not about using so much chilli that it brutally murders your taste buds, subjecting them to a slow and painful death, but instead it’s about being just spicy enough so the hop bitterness from a gulp of delicious IPA or Pale Ale enhances that spice. As winter approaches I will be doing a short series on beer and curry experiments as I’ve read lots of bits and pieces on lager with curry, links between India Pale Ale and curries (it seems the British ‘Curry and Pint’ night is a pub favourite) and played around a little with beer & food matching for small events in the past but I think it requires a more dedicated approach. And yes, if it means drinking more beer and making lots of different curries then I’m happy to take on the role. I’m just dedicated like that. 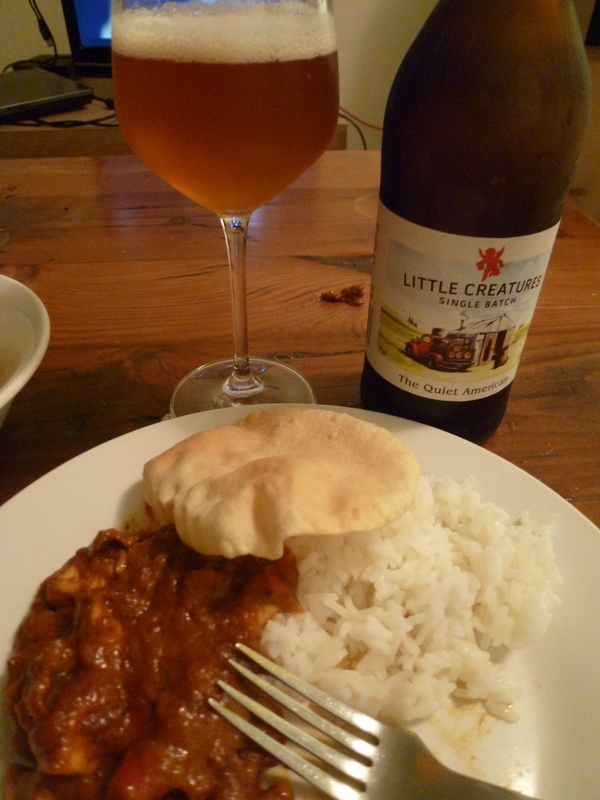 Anyway, back to the point of The Quiet American, Little Creatures latest limited release, and another LOUD dish – Curry! My boyfriend and I got home from work late one night and decided curry was a tasty but easy, ‘cannot-be-stuffed-with-anything-else’ dinner. We used sauce from a jar and added some locally produced Chilli Achar (Crunch Preserves) just for shits and giggles. And by “some” I refer to the massive dose that fit on the largest spoon we could get into the jar. Incidentally, the Chilli Achar was an impulse purchase from Boyanup Petrol Station on our Ferguson Valley adventuring where we also got bird seed … love country towns. Moving on … our Chicken Madras Curry with Chilli Achar, Mushrooms and Red Onion was another great hit with The Quiet American. I’m really enjoying the way red onion plays with the rich sweetness in this beer though my opinion is bias since I have started a (totally healthy) love affair with red onion and add it to almost every single dish. It tastes good and it’s just so darn pretty (there’s a joke in there somewhere). With the addition of the Harissa Paste, the curry carried the right amount of heat matched with the American hop bitterness. I keep saying “matched” because, well, it’s accurate but it’s more than that. It enhances and alters the spice flavours, like a collaboration between two great brewers that gets all beer geeks excited. Throw in everything and simmer for ages!